The biggest hot air balloon festival in the world is held each year in October in Albuquerque, New Mexico. An unlikely place perhaps, until you learn about the phenomenon known as the ‘Albuquerque Box’. For a few days in early October the wind patterns are composed of northerly surface winds – where cold dense air moves downhill – and southerly winds at height, created by high pressure systems over the Gulf Coast. This complex weather system forms a ‘box’ pattern that potentially allows hot air balloon pilots to take off and land in the same spot. 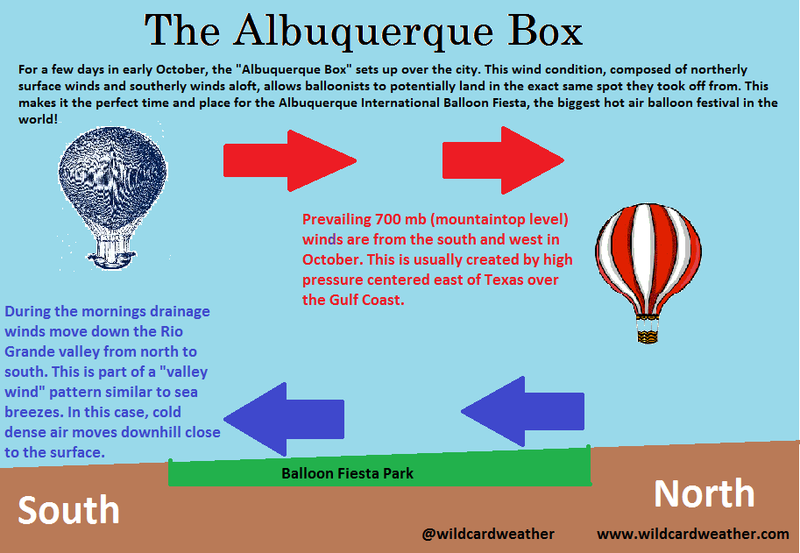 As described in this informative diagram from wildcardweather.com, the Albuquerque Box weather pattern affords balloonists an opportunity to take off and land in the same place. It is a grand example of how the interaction between earth, air and water forms wind patterns. Elsewhere on earth, balloon pilots usually take off and land in different locations. All pilots have to balance the use of fire to warm the air in the balloon with reading wind patterns. It is a skilful role that started in Paris in November 1783 when the first untethered manned hot air balloon flight was performed. Since that time countless people have experienced the awe and excitement of hot air balloons. 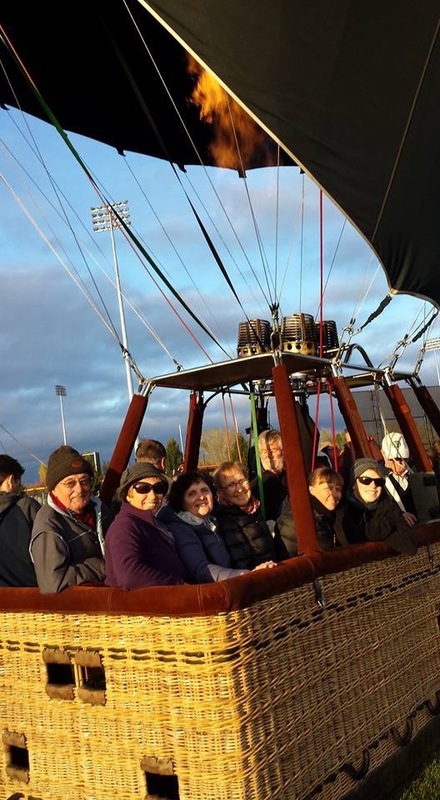 My friend Siwan Lovett recently joined this group when she took a hot air balloon flight over Canberra, Australia with her family. She described it “as an amazing way to travel as you just move with the wind currents”. Flying over a landscape with hills also provided valleys to look down into. These landforms would also influence the wind patterns. It’s all interconnected. The following images of Siwan’s flight provide the best record of the elemental nature of hot air balloon. Thanks to Siwan for sharing them. 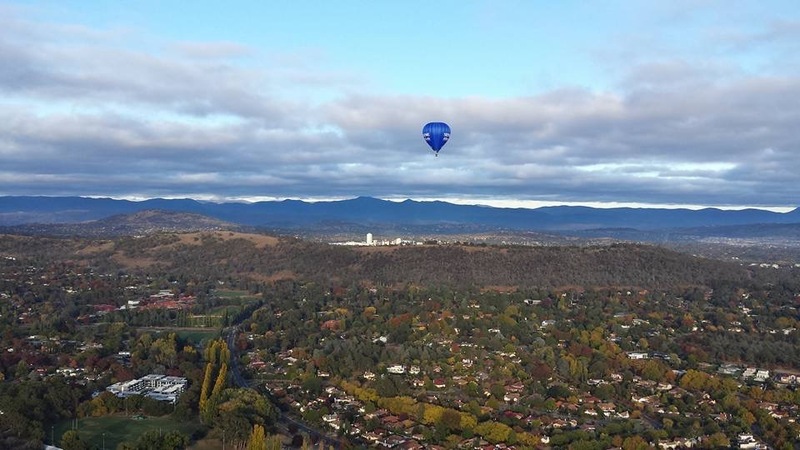 The hot air created by the propane fire is about to take Siwan and her family over the hills and valleys of Canberra, the capital of Australia. Each ballooning day will be different depending on the wind patterns and other atmospheric conditions. The birds eye view from a hot air balloon provides a different perspective of the place we call home. 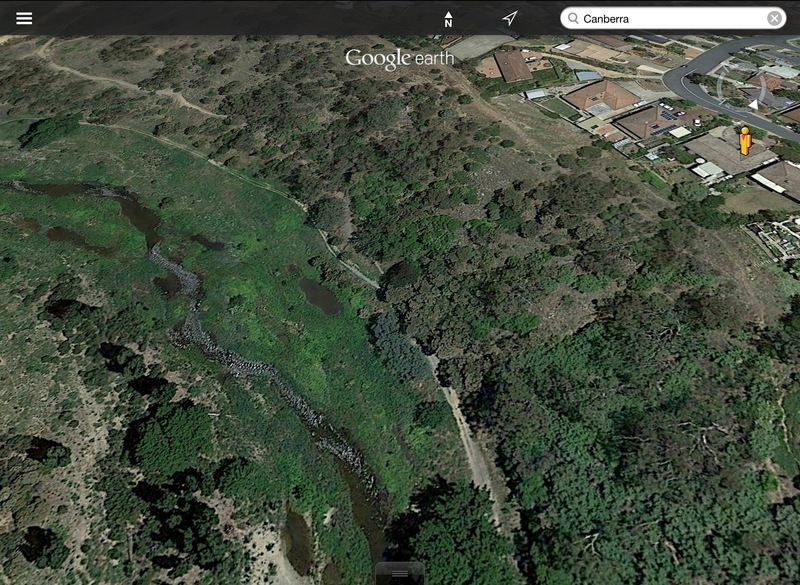 This image illustrates the leafy nature of Canberra, the national capital of Australia. The amount and diversity of vegetation provides habitat for over 200 bird species, giving Canberra the richest bird life of any Australian capital city. The cloudscapes and mountains surrounding the city are also entrancing. 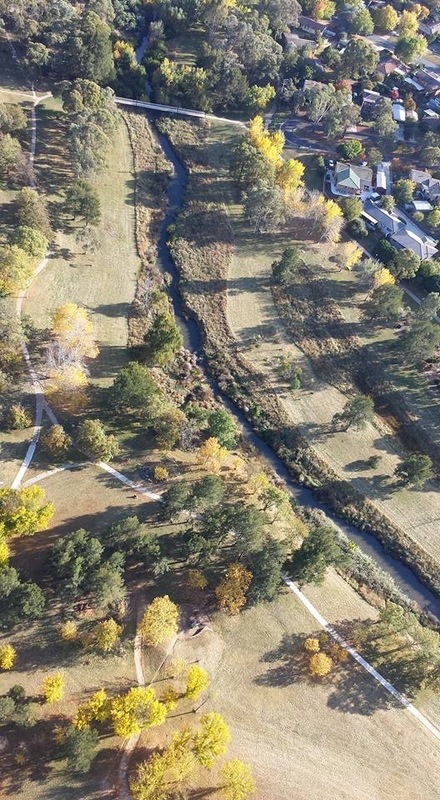 Siwan is the creator of and force behind the Australian River Restoration Centre, so it is no surprise that a riparian zone or two features in her ballooning photos. This more detailed image shows the complex mosaic of earth, vegetation (introduced and native), water and houses that often occurs in peri-urban areas. It’s true that now you can view the earth from the ‘air’ using Google Earth and similar programs. While these are fantastic tools, they are yet to capture the delight of moving with the wind currents, or feeling the heat of the propane fire, or experiencing a bird fly past. Imagine what it would have been like for balloon passengers in the late 1700s to see the earth from this perspective without the benefit of satellite imagery. This entry was posted in Aether/Space, Air, Earth, Fire, Water and tagged Air, Albuquerque, Ballooning, Canberra, earth, Fire, Water, Wind. Bookmark the permalink. Usually I like to write from personal experience. To date I’ve neither been in a space shuttle or a hot air balloon. The closest I’ve got is aeroplanes of various sizes and the balconies of tall buildings. What impresses me most in these cases are the clouds. 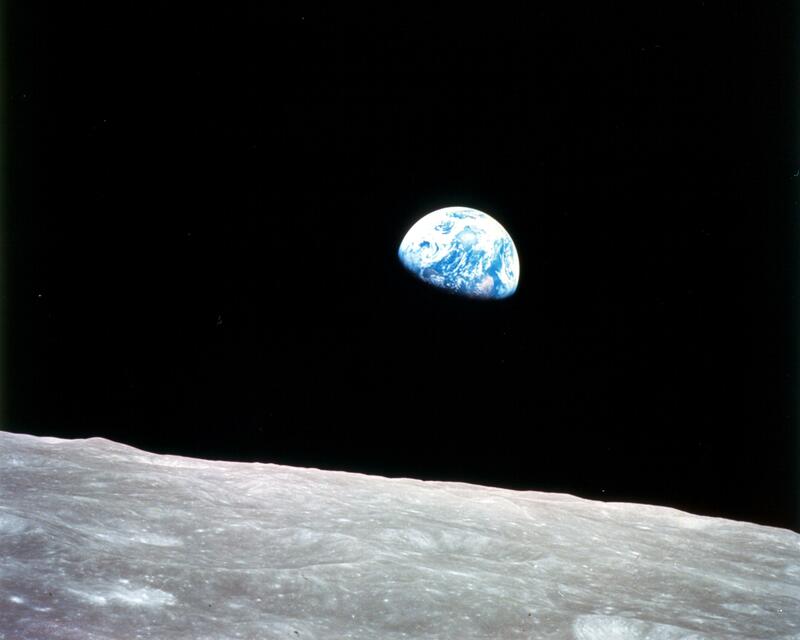 They certainly have no borders, as the Earthrise image showed almost 50 years ago. What have we learnt in the intervening decades? I haven’t travelled via space shuttle or hot air balloon either, however after reading your post I’m thinking I might try one or the other. Perhaps a hot air balloon! In reflecting on your observations about the benefits of the latter pastime, it occurred to me that, in many ways, it is a very respectful way to view the countryside as you have to get up very early, you can only go on certain days when the weather is suitable, and you move through the air ever so slowly. There is also a small level of risk involved which would add a feeling of stepping outside of one’s comfort zone. Maybe we should try it one day! I would love to go hot air ballooning with you one early morning. Your comment about it being respectful is an insightful one.